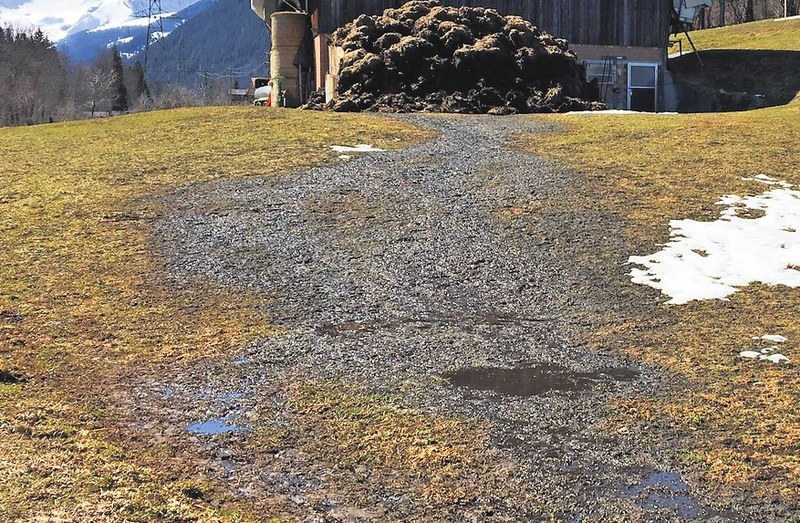 Gstaadlife | What do you do when a manure pit is full? What do you do when a manure pit is full? Spring is on the way and the liquid manure boxes are getting full. Here and there, liquid manure is on the verge of overflowing. If the weather and thick blanket of snow get in the way, alternative solutions need to be found to stop this from happening. Sometimes, there comes a point when no more liquid manure can be spread in the autumn and the pits are full by the beginning of winter. Another problem is when winter goes on for longer than expected and more space is needed for animal faeces. However, extra space isn’t always allocated or available. Also, some pits weren’t measured correctly when constructed, but are still within the legal minimum. Martin Jutzeler from the Office for Agriculture and Nature notes that some slurry tanks weren’t properly dimensioned when built and these now need to be extended. The weather is also partly responsible for wreaking havoc on manure spreading resources. If it rains a lot, water can run into the pits and fill them up. Sometimes, more animals are kept inside the barns for longer periods than usual or planned for. The agricultural advisor has various solution to solve these problems: "Farmers could move their manure to other land they own, providing extra storage space." By this, he means that farmers who have multiple stables with manure pits could check for any free space for manure. Jutzeler also considers that a potential solution is renting space for manure storage from another farmer who has spare capacity. What should a member of the general public do if they discover a manure pit that’s overflowing on their neighbour's property or when out on a walk? According to Martin Jutzeler, "It’s always difficult to know what to do." When it comes to giving sound business advice, the sensible thing would be for people to go straight to the farmer. "But they might find this very difficult because they usually don’t know the farmer." Of course, people could also contact the municipal authority and report a problem of overflowing slurry, says Jutzeler. "The authorities would then contact the "guilty" farmer and point out the problems spotted. They could also demand remedial action, if necessary." One final option, possibly a little extreme, is to contact the police and lodge a complaint.